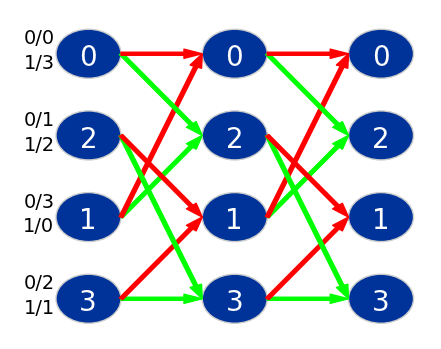 A trellis diagram is a representation of a convolutional code. 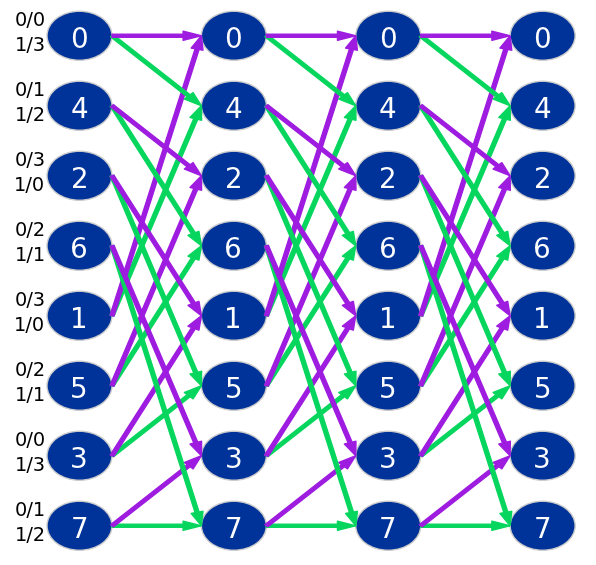 During the study of convolutional and turbo codes, one often encounters situations where we would like to visualize the trellis diagram representation of a simple 4-state or an 8-state convolutional code. CommPy is an open source toolkit implementing digital communication algorithms in Python using NumPy,SciPy, Matplotlib and Cython. The visualize function in CommPy’s Trellis class is an attempt to make plotting trellis diagrams easy and simple. Here’s how to use it. The snippet of code above and the trellis diagram correspond to the convolutional code generated using the encoder matrix, $$ G(D)=[1+D^2,1+D+D^2] $$ The polynomial entries correspond to the octal representations 101 (05) and 111 (07). The input/output labels are shown along with the states for the first stage of the trellis and the edge colors depict the output.